The Richland area includes a gorgeous country club for swimming, tennis, golf, and social events, a branch of the Nashville Public Library, its own seasonal farmer’s market, and the Richland Creek Greenway. The Greenway is a wildlife conservation area where one can spot great blue herons, red-tail foxes, and other wildlife native to middle Tennessee while hiking through trails and crossing the Old White Bridge. Turn off the trails and you could end up at the new Belle Meade Hill Center, including grocery shopping at Publix, boutique shopping at Blush, and frozen yogurt at Sweet CeCe’s. 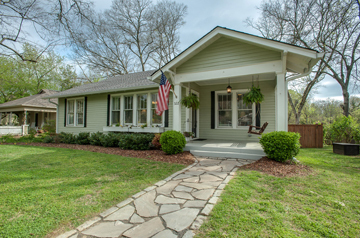 Learn more about the Richland Neighborhood and its Real Estate Market here. Located in West Nashville, most Sylvan Park homes are priced between $300,000 and $500,000. Many of the streets in this neighborhood are named after states because when this area was first being developed, city planners hoped people from all across the country would want to live here. Sylvan Park is filled with 1910-1940 frame-and-brick bungalows as well as 1900-1915 Princess Anne cottages. The neighborhood is going through a transitional phase now as new construction is coming in some areas while historical homes are being preserved in others. The area calls itself home to cool local hotspot McCabe’s Pub Nashville Ballet School of Dance, Nashville Opera, and Climb Nashville, the city’s best indoor climbing gym. Award-winning Star Bagel Café is another local favorite, the oldest and only locally owned and operated bagel café in Nashville. Learn more about the Sylvan Park and Sylvan Heights Neighborhoods and their Real Estate Markets here.